Seku Neblett purposefully articulates the connections between African creative work and political struggle. Music has always been part of Neblett’s life and work, and his art has always been intended to inspire political unity. He and older brother Charles Neblett, along with Bernice Johnson Reagon and others, were original members of the Freedom Singers, created in 1961 in Albany, Georgia. In the 1960s, the Freedom Singers toured the United States to raise money and organize support for themStudent Nonviolent Coordinating Committee (SNCC), a key organization in the Civil Rights/Black Freedom Movement. In the late 1960s, he returned to Conakry, Guinea, to study history, culture, and organizing under Nkrumah and Touré for 18 months. The 1970s and ‘80s found him traveling the world, speaking and organizing. 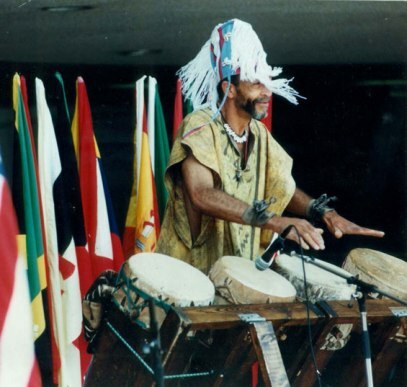 In 1991, a chance encounter while performing with the Freedom Singers led Seku to play the Bougarabou, the signature drum of the Jola people in the southwest of Senegal and the Gambia. He plays both the Bougarabou and the Djembe extensively. However, each is used for different purposes by Brother Seku. Seku Neblett is a part of the Cultural Workers Bureau and is available to perform at colleges, universities, cultural festivals and community events.